As you may remember, I had entered a challenge for the event Writer’s March (discussed in this previous post). My challenge to myself was to write at least a page a day of personal writing every day for the entire month of March. I am here to give you a recap of my experience. So, I may or may not have written sporadically, as I always do. At first, I tried to write my page every night before bed, but that only worked for about 10 days. 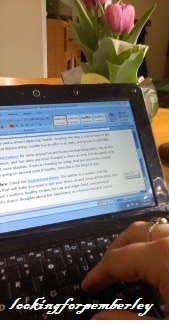 Then, I started writing my page (or less, or more) in the mornings and while waiting for my tutoring students. I did not necessarily accomplish my goal, but I also wouldn’t call the challenge an unmet failure either. There wasn’t a page of personal writing every day, but some days I wrote thousands of words of personal writing, including the start of a fiction story that might become something interesting. I did write a lot more in my journal for the month of March than I have been. Even if it was only a few sentences some days, I think it was quite productive. I did think about it practically every day, although some days I actually just forgot. Oops. So, at the end of this month what were my creative gains? Learning more about my writing needs. I didn’t realize how that daily practice of writing non-fiction articles had really shifted my writing tone, until I started trying to write fiction again. It was a pretty startling change. I think I need to keep following other writers’ blogs, and keep challenging myself to write for myself even if I am tired. I started singing, more cell phone pictures, and oil painting again. Oddly enough, thinking of what I needed to do in terms of writing opened up a lot of other creative outlets for me. I have also been more inspired lately to dream big, and have decided to create a list of creative goals for myself to enrich my life. Despite the fact that I was partaking in a challenge for Writer’s March, I also seemed to keep encountering facts and information about NaNoWriMo, the writer’s month in November that challenges people to write an entire novel in a month. Information about this event kept popping up this month, in books and on the internet. I think it’s a sign I need to write a longer work soon, a thousand words (ish) a day. I have learned that I need to be more kind to my wrists, and to write with pen and paper as often as possible. I am also going to start stockpiling money for a new computer. The tiny netbook was great for riding my bike around, but it is a little cramped for being a professional writer and working on it all day, every day. Nope, pen and paper are my friend I also think more clearly when I write with pen and paper as well. 4.5. My reading increased pretty dramatically, although I keep losing my books (so not sure I can count this as a whole gain). Really, losing books is quite a nuisance, and has never happened to me as much as it has this month. I am starting Ulysses, am reading short stories from Jane Austen Made Me Do It, was almost done with the Happiness Project (before I lost it), reading another Jane Austen continuation, The God of Animals, and a few other novels currently. (I promise to have a book review for you in the coming weeks!) I am very close to the end in a few, if only I could find them. I highly recommend checking out the Writer’s March site for helpful writing discussion and writing tips. Even though I may not have reached my goal in the traditional way, I did it in my roundabout way, which is really generally the way I do things, and has worked for me so far. It has been rewarding. Thanks to the creators of Writer’s March for their support, and thanks to my readers as well. This entry was posted in Creativity, Writing and tagged Blogging, creativity, netbooks, Painting, typing, wrist soreness, Writer's March, writing. I share your pain. Once I started relying on Computer programs I found it increasingly difficult to pick up a pencil and start drawing again. I am currently working on a third drawing for “A Paranormal Romance” (to be published in our student annual at Clark College “The Phoenix”). Moral: Ditch the computer and go back to using your hands on a regular basis. It is essential to open up clogged Artistic outlets of all sorts. Yay- that makes me happy to hear! Fascinating. Writing fiction vs nonfiction and how you can get in the trend of one and find it hard to get into the other…. I like that you began singing, painting, and taking pictures, too. I read somewhere that writers benefit from having other creative outlets, and I agree. Flower arranging relaxes me and puts me in a state where I can easily begin to write. I’ll visit again soon. Promise! Thanks Candice! So great to hear from you, and very glad you enjoy the blog! I guess I missed March but I checked out the site and they do have some great advice! I find it so hard to find time to do everything I want to do in a day. Your blog is great and really inspiring. I have been trying to tap into my creative potential, partially through blogging, but with some other things as well. (crochet-not doing very well). I’m not sure if you or any of your readers have heard of it but there is a great book called The Artist’s Way by Julia Cameron. It was recommended to me by a writer and it is amazing. It’s basically an instruction book with exercises to get your creative juices flowing, it’s like a 12 week program. It sounds cheesy but it just gives you the push you need some days.